Do you have a sconce or ceiling light fixture but no electrical receptacle for it? 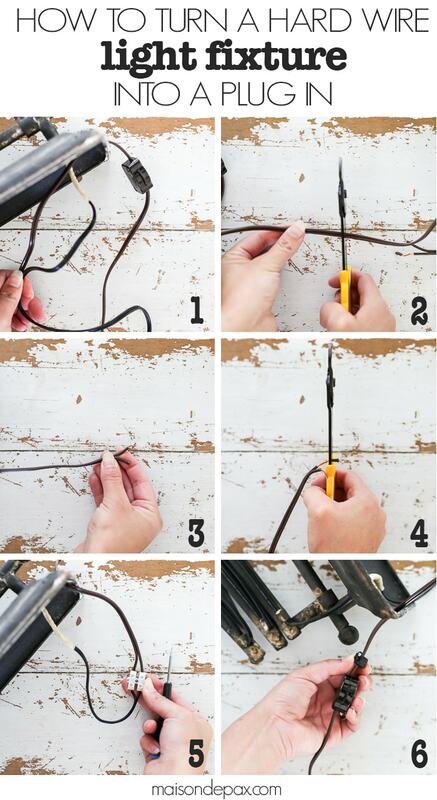 See below how to convert any fixture from a hard wire light into a plug in so you can use it anywhere! 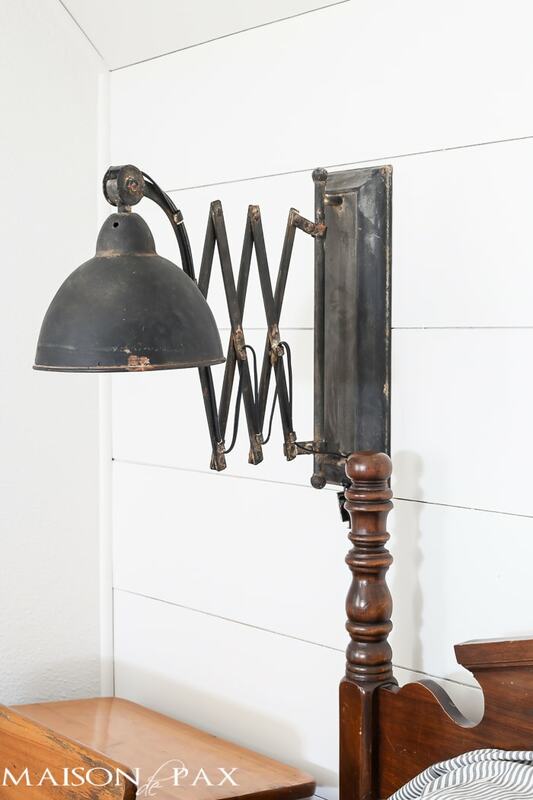 Months ago I came across these gorgeous, vintage looking, industrial accordion sconces, and I knew they would be perfect in my son’s room, especially on the DIY plank wall we recently completed, but unfortunately they were hard wire light fixtures. And at ~$50 each, I thought they were a steal, but we did not have wiring in the spots where I wanted to hang them. Rather than open up and rewire the wall (because, if I’m being honest, I might will almost definitely rearrange the room sometime and NOT want sconces there), I decided to covert the hard wired lights into plug ins. And I’ve got a step by step tutorial for you, too. Warning: I have basic wiring skills, but I am NOT a certified electrician. This project is completely at your own risk, and I take no responsibility for any mishaps you may have as a result of this tutorial. Please be careful and consult a certified electrician if you are in any doubt. Be sure to give yourself enough room to trim and connect without having too much excess cord to hide behind the cover plate. Don’t forget to take into consideration the placement of the switch if you are using a lamp cord with a switch; you want to be able to reach it! Using wire cutters, cut both cords (the one coming from the fixture and the one from the lamp cord) ~1/2″ longer than you need them. 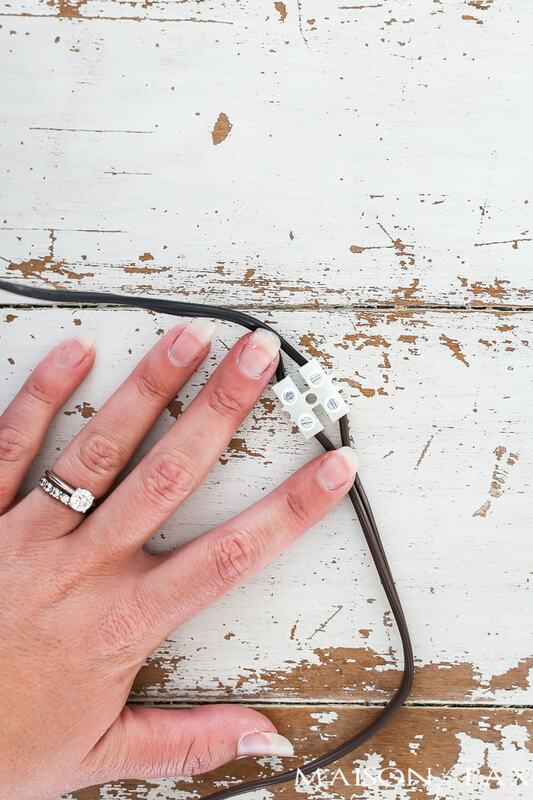 Using your fingers, pry apart your two wires ~1-2″ on both the fixture cord and the lamp cord. Your fixture may already have the wires separated, which is fine. Using a wire stripper (or sharp scissors very carefully), strip the plastic sheathing off the copper wires without cutting the wires. You will do this four times: 2 wires per cord. Find a “way out” for your cord. Since the wires for a wall or ceiling fixture normally go into said wall or ceiling, you will need to find a way for the wire to get out of the cover and hang down the wall without making your fixture uneven. You can cut or bend the plate cover, drill a hole in the plate cover, make a little cut in your wall, or use whatever creative idea you might have. Fortunately for me, the fixtures actually came with “way out” of the wall plate, so I simply removed the little plastic insert before I started the project and replaced it when I was finished, securing the switch in place directly below the lamp. Obviously every light is different, so you’ll have to figure out this one. 😉 Mine included holes to hang on two screws, so I secured 2″ screws into studs or sheetrock anchors. 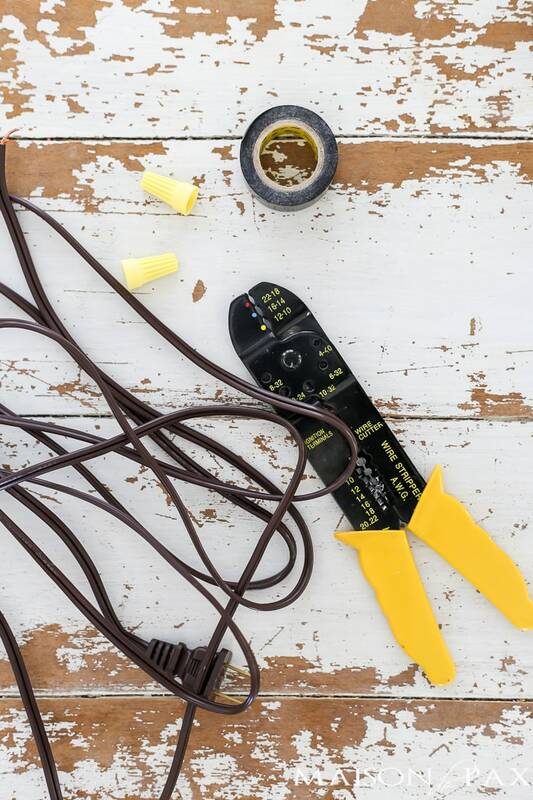 Note: This tutorial addresses a fixture WITHOUT a grounding wire (in other words, the cord is made up of only 2 wires and the plug has only 2 prongs). For fixtures with grounding wires, you would want to use a three pronged cord and match up your three wires appropriately. Sometimes wires are color coded; if so, match up your colors. If not, most cords have a slightly ribbed side and a smooth side. Match up your wires: ribbed to ribbed and smooth to smooth if so. My fixtures included these awesome little terminal boxes which you connected by tightening the screws onto the wires. I have not found these available online (though I may just not be looking the right place! ), but wire nuts and electrical tape will always work. If using a similar terminal box, make sure your ribbed wires are facing each other and your smooth wires are facing each other. If you connect using wire nuts, be sure your wire nuts are for the appropriate size wire (standard lamps have 18 gauge wire… you can see it printed on the cord usually), twist the wires carefully together (white to white or smooth to smooth, etc. ), secure with a wire nut, and then secure further by wrapping in electrical tape to hold the wire nut firmly in place. Note: the main thing you want to ensure is that your white and black or your smooth and ribbed NEVER touch. If they do, they will short out your fixture when you plug it in. So be sure the entire wire portion (that is not covered by plastic) is enclosed in the terminal box or wire nut. Exposed wires are never a good thing! 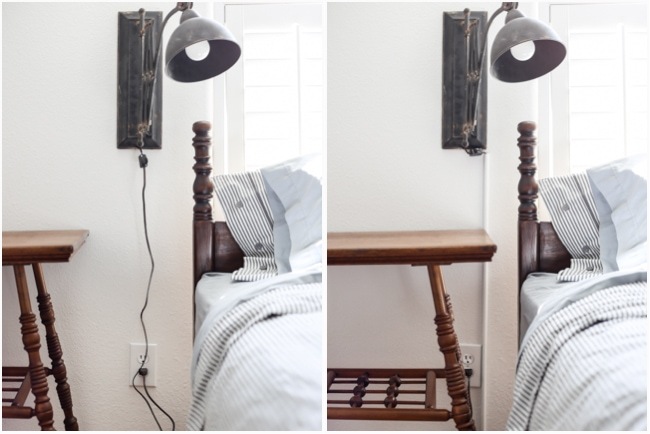 How to hide the cord for plug in sconces. This step is not rocket science. All it takes is one cool little product I ordered from Amazon prime (have I mentioned I really make use of my prime subscription?!). After changing the lights to plug ins, I had exactly what I wanted for my boys’ bedsides… except for the brown cord that was not only ugly but a possible tripping hazard for my kids. So I got these great cord covers and cleaned it right up (and the instructions on the package are so easy to follow! It only took about 3 minutes)! Since my walls are white, I left them alone, but they are paintable if you have colored walls. And the nook that we recently planked. I am even contemplating working up a chandelier like this for my daughter’s room. I don’t want to take down her ceiling fan (because we live in Texas!! 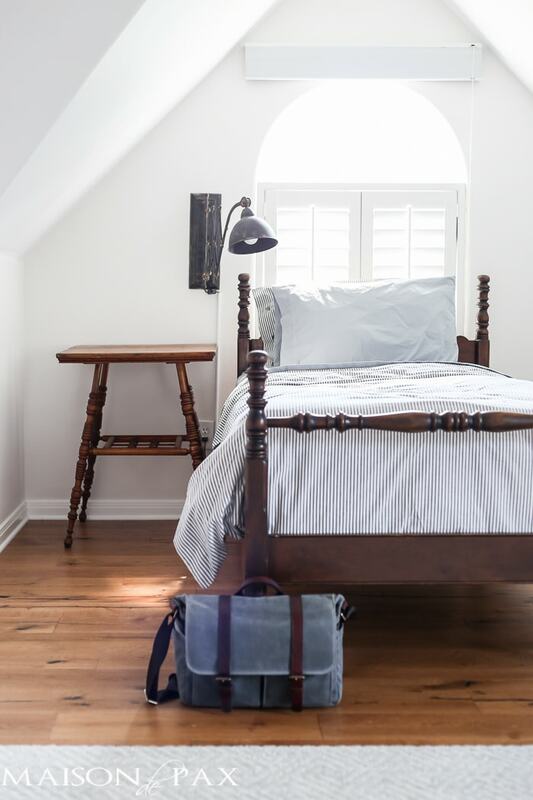 ), but I thought it might be fun just to add a pretty chandelier above her bed. Does it make sense to hire an electrician to rewire something there (not even centered on her room)? Not really, but I could just hang it and hide the cord until we redo her room some day and no longer want it, right? I love the possibilities this offers! And now you can, too. What do you think? Where would you like to put one? 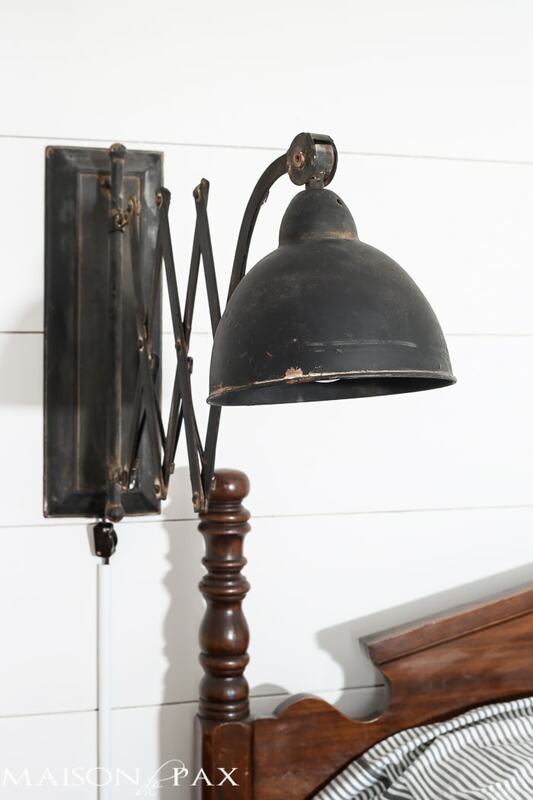 Where did you get your vintage accordion light sconce? I had a friend that asked me about this – but wants to do it with a chandelier. I will send her over, great post by the way. Thank you so much, Glenda! I’m so sorry, but I’m afraid rewiring the whole chandelier is not something I’ve ever tried… I did have an electrician rewire one for me when he was doing other work at our home, though. You might ask around to see if there’s an electrician who would like to freelance a bit rather than taking it into an expensive lighting store. I hope you are able to find someone! Love what you did. Where did you find those little connectors on line. I’m so glad you like it! Unfortunately, I was unable to find connectors like this online (mine came with the lamp), but a regular wire nut of the appropriate size should accomplish the same thing. I hope this helps! Sandy, I’m so glad it was helpful! What do you do if your light fixture has a grounding wire? but your plug does not? I think the safest thing to do is to look for a plug that has a grounding wire. I’m not a professional electrician, and while I don’t think it would hurt anything not to connect the grounding wire, I would be most comfortable using a grounded plug with a fixture that has a grounding wire. This is such a great tutorial- thank you! My fixture that I converted today has a ground wire. I asked an electrician and he told me it would be totally fine to just cut it off. This is wonderful information! I never knew this could be so easy! Now I feel empowered! Thanks! Do you have a tutorial on how to do the opposite? I have a plug in lamp I want to hard wire above a sink. When I bought it, I thought that’s what I was getting! If not here, maybe you can point me in the right direction? Thanks!! Hi Danielle, actually the opposite is simply to cut off the plug and strip a short portion of wires. I don’t have an actual tutorial, but I’m sure if you google it you can find something. I hope this helps! I have a hardwired pendant fixture that I plan to convert. If the cord is too short to reach an outlet, may I replace the cord with a longer one? Thanks for this – I loved he tutorial. I’m having issues with your links however, as none of them link to the products you mention and all seem to link to A spam type site. Can you correct them? Thanks for letting me know- I’ll investigate them soon! Super clear and helpful tutorial! Funnily enough, I found your site searching for general information on how to convert hard-wired sconces to plug-in, but I’m planning to buy the very same fixtures! Was hoping you could confirm something — do the arms on these sconces move left and right? I’m finding competing information online. Cheers! How funny! So glad you found it helpful. 🙂 . 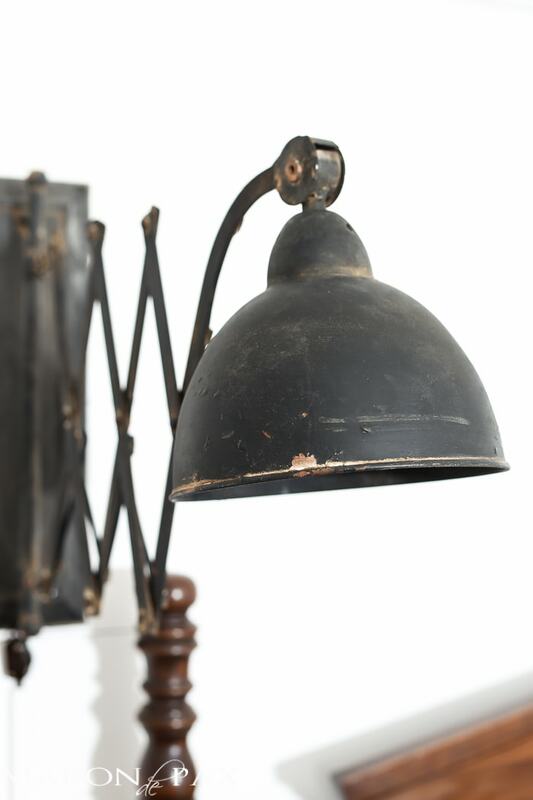 The arm only technically comes out and in, not side to side, but the actual head of the lamp pivots a little at the end of the arm; does that make sense? I hope this helps! Totally makes sense! Too bad the arms don’t have the ability to pivot left and right, but sounds like the rest of the movement still allows for quite a bit of flexibility. Thanks, Rachel! I literally just received these light fixtures from Decor Steals TODAY and the ONLY movement is in and out. The “shade” moves up and down but there’s no way to make it stay up so essentially, it just hangs straight down. I, too, am disappointed that these arms don’t turn right to left. Based on your 1st picture, it looks like the light arm swivels over to the right. I literally just received these light fixtures from Decor Steals TODAY and the ONLY movement is in and out. The “shade” moves up and down but there’s no way to make it stay up so essentially, it just hangs straight down. Disappointed that these arms don’t turn right to left. But thanks for your tutorial, because that’s exactly what I intended to do when I ordered these lamps. I’m so glad the tutorial is helpful! And I’m sorry to hear the lamps aren’t as flexible as you hoped. Honestly, one of them sort of hangs to the side a bit and the other one doesn’t. If I had them both on either side of the same bed, it would annoy me, but since my boys’ beds are across the room from each other, I was thankful that one of them hung off to the side a bit because it worked better for lighting his reading. I, too, wish they both had fuller movement, but the price was still so good and they are so cute, aren’t they? Hey there – Thanks for the how-to! By the way, I think I found the wire connector you used on Amazon (Try searching Findfly CH2 Connector Screw Terminal – I’d link it, but I’m not sure if it’d be marked as spam). Thanks! Thanks, David! Glad it was helpful. 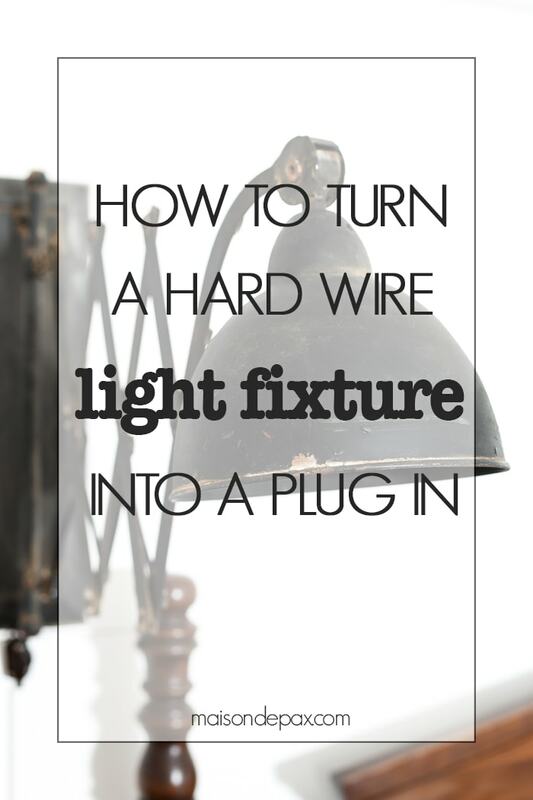 I was googling how to convert a hard wired light fixture to a plug in light fixture when I come across your post. 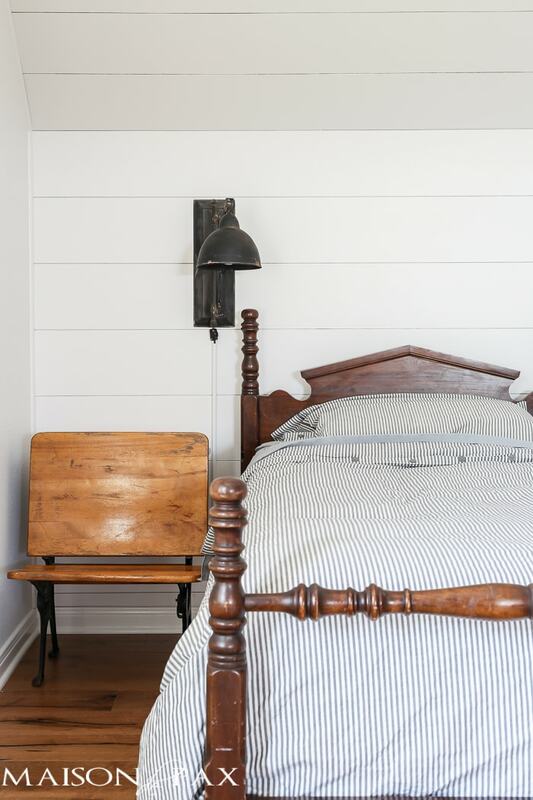 I have the SAME exact light fixture from decor steals that I’m converting and about to hang in my new bedroom! Too funny! I hope you found it helpful! Wow, what camera did you use to take the pictures? Thank you! This post was perfect for me. I bought a medicine chest at Home Depot that said something about a plug on the box. I bought it thinking it plugged in. Nope – it meant there was an outlet inside as well as the lights on top and it was hard wired. I really liked it so I picked up an extension cord with a ground so it matched up. This took me less than an hour today. I am so proud I did it myself with your how-to! Thanks for sharing. I bought these exact lights so I’m so happy to come upon your blog! I was feeling defeated when i saw that it needed to be hard-wired. Off to the hardware store now….thanks again! Yay, Cindy! That sounds like a win for you. Hope you love your lights. You’ve convinced me: I’m gonna give it a try. Any tips/advice on how to twist the wires together when making the connection? Thanks!